Cobb Salad is a bright colourful mixture of veggies, protein and cheese. I’ve incorporated the same idea into my Cobb Pasta Salad. 2. Combine ingredients for dressing and mix into pasta. 3. In a small skillet sprayed with vegetable oil, add corn and tomatoes. Sauté on a high heat until corn and tomatoes begins to brown, about three minutes. 4. 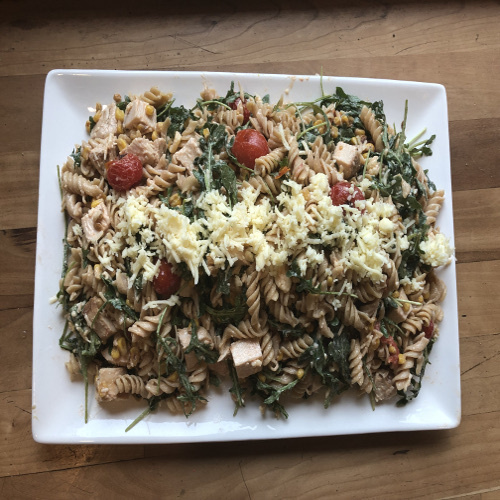 Toss corn, tomatoes, chicken, avocado and cheese with pasta or place all ingredients in a neat row over top of pasta to resemble a cobb salad.